Apparel Candy is an online wholesale clothing company offering a vast array of quality clothing at rock bottom prices. They have the hottest trends in fashion that includes jumpsuits, tops, pants, dresses, skirts, jeans, sweaters and plus sizes. In addition to clothing they offer shoes, jewelry, cosmetics, fragrances, handbags and more. Apparel Candy goes above and beyond for their customers offering outstanding customer service, fast and reliable shipping and a refund policy. You won't find better products or service for wholesale clothing anywhere else! Can you believe this dress only costs $8.50 for wholesale? You can get 6 of them for $51.00 and that's what so many clothing stores charge for just one. Can't believe the great prices? Wait till you see this fabulous cape... I told you they have the hottest trends and capes are totally in this season! It's 100% wool and only $8.00 per cape. You can get six of these great capes for only $48.00. That's what I've paid for just one cape from a store. They have so many great products and at super low prices. It's hard to pick just a few items to feature. 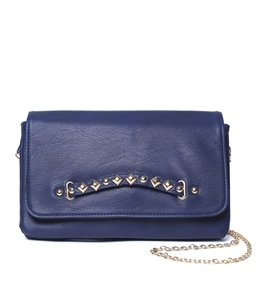 Since I'm a handbag junkie I had to mention this super cute clutch that goes for only $7.50 a piece. Then there's this amazing top. 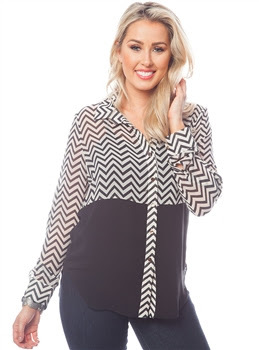 It's a black and white chevron printed blouse with color block detail. *Disclaimer. I was compensated for this review by Apparel Candy. However, all opinions are true and honest. I always get nervous with these kind of boutiques. The prices are great but it makes me wonder about the quality.